Celebrating persons who have helped make Shaker Square a special place. One of our town's strengths, and you see it in Shaker Square activities, is that community leadership isn't limited to people who grew up here. We welcome newcomers. Our previous Citizen, Donita Anderson, founder of the Farmers Market, came here in 1985 from Michigan. As editor Kristen Romito writes in the most recent issue of The Connection (below), Carol Lowenthal and her husband came here in 1977 from Minneapolis Minnesota. Another strength of the Square is that its uniqueness attracts people in nearby areas. Examples: Donita Anderson is from the Onaway area, Carol Lowenthal from the Boulevard School neighborhood. Many friends of the Square live in nearby parts of Cleveland Heights. 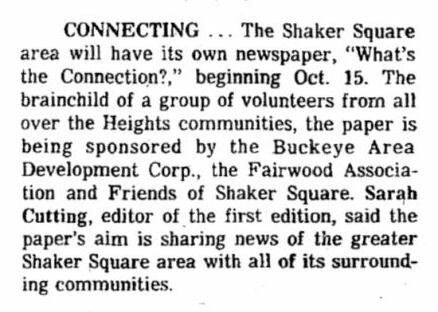 Read the Plain Dealer story (below) about The Connection's founding and you'll see that interest in the Square is also found to the west - in the Buckeye area and what was then called Fairwood. Thanks Carol for your role as founder of The Connection and for your long and devoted service to Shaker Square. The above clipping is from the Spring 2014 issue of The Connection.